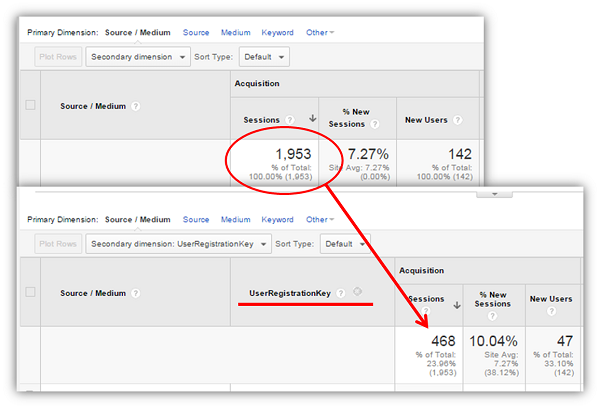 If you’ve made the leap into custom dimensions with Google Analytics, you’ve probably also tried to make a custom report to segment your traffic with the new dimension. You add the new dimension and suddenly the numbers don’t look right! What gives??? Like several other special dimensions in Google Analytics, the Custom Dimensions do not have a an empty ‘(not set)’ value. If you include the dimension in a report, there is no catch-all row to total up all the sessions that didn’t have a value to display. Instead, the report simply drops all that extra data. Make sure you check the fine print (light grey text under the column aggregate numbers) where you’ll see a comparison to the website totals.